Bostonian Cara Gilman wears many hats: yoga teacher, run coach and mom boss. Her RunYoga series—an in-person and virtual community combining yoga, running, and mindfulness—allows her to bring those passions together in a way that’s accessible and approachable to others. 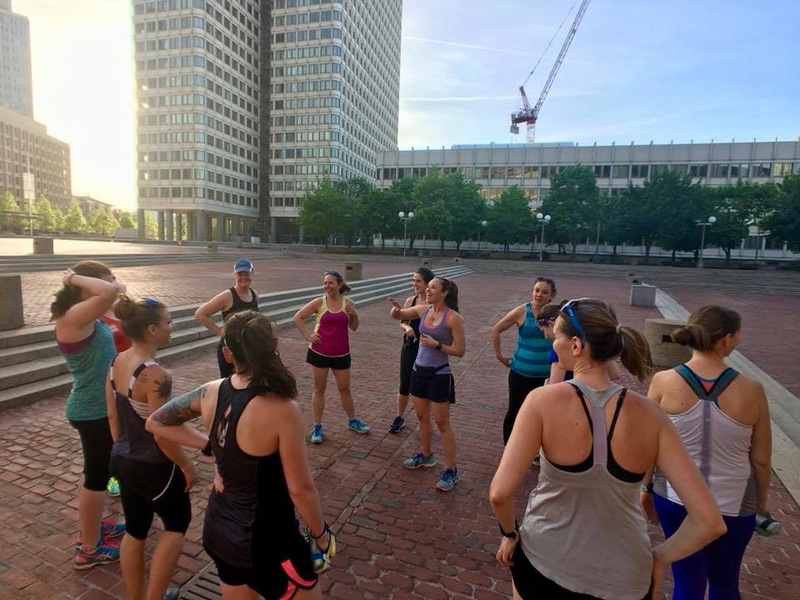 Cara’s knack for creating a tight-knit community around Boston and beyond, strong sense of self-compassion and persistent hustle (all while having fun) make her a woman we’re watching. You come from the corporate world. Tell us about how you made the jump into working for yourself as a wellpreneur. I always knew I wanted to change the world, make an impact and help people, but coming out of college, I only knew corporate life. I worked in corporate America for about six years and I was always focused on, How can I serve? How can I help? How can I make an impact and a difference? What first landed me in this space was working in community affairs with nonprofits and event sponsorships. Being a young 20-something, I realized how lucky I was to meet so many people across the company through executives and networking opportunities, but I saw that other employees didn’t have that opportunity. So I ended up creating an employee network called State Street Connect—hosting networking breakfasts, meet-and-greets and other events. I was so interested in yoga, so I started a yoga club through State Street Connect, and networked with some other yoga teachers in the company to see how they balanced it all. I met this woman, Patty Anderson, who used to be a full-time fitness instructor and thought, “Okay, I can do this!” She mentored me, and that’s how I got my first teaching gig! I would come out of that class feeling so good, like I was on the right path and from there, I just wanted more. So I signed up for Yoga Teacher Training [at Back Bay Yoga] and started taking class every week. After a few weeks, I asked [the studio owner] if we could grab a smoothie and talk about it all, and she ended up having me assist her and gave me some yoga classes. Flash forward a year, and I knew if I really wanted to do this, I needed to leave my corporate job. Luckily my husband was like, “Go for it!” The moment something was holding me back from teaching, it was time to let it go. I look at the yoga world as the business world: you show up, you network, you show face. I really couldn’t have been more grateful for my corporate experience to set me up for success. When I was in it, it seemed like chaos, but looking back it couldn’t have been more perfect. RunYoga brings together your love for running and yoga, but running actually came first for you. What inspired you to bring yoga into your practice? I found yoga because of running! Through my time at my corporate job, I ran like five marathons in seven years and my body was like “What? !” I had these injuries that kept coming up and running didn’t feel the same it used to; I was burned out physically and mentally. I had a gym membership so I thought I’d try yoga and I loved it… I was hooked. What can people expect from your RunYoga series, and how is it different than your typical running club or drop-in yoga class? When I first started teaching RunYoga, I was like, “Okay let’s go for a run and stretch afterward.” What really transformed yoga for me was when I went to India and learned about Yoga Nidra and meditation, and I was like “Wow, I really need to bring this into RunYoga!” It’s not only a physical thing; we work on mindfulness, mantras, connection and being present when things get hard. It’s learning how to have more compassion for yourself. Yoga can be very intimidating to people, but we’re not doing fancy things; we’re doing things that are challenging but accessible. It’s really cool to see yogis come to me and want to run or runners be so open to the yoga thing. There’s no one looking around to see who’s the fastest; everyone is there to feel good and have fun and that’s what makes it so special. You started RunYoga as a live series in Boston, and just recently launched a virtual series. What can people expect through this new program, and how do you instill a sense of community even when you can’t meet with people in real life? The program comprises of an audio meeting where I give the lay of the land of what to expect, and then each week you get two yoga videos, a meditation and a reflection exercise, and additional resources like podcasts aligning with the theme for the week. The community piece is driven through Facebook. At the beginning of each series, I do an intro where people introduce themselves and post pictures, answer questions and share. I’ve also been getting some races on the calendar so people doing it virtually can still come out and meet people! And I’d love to start hosting some retreats where virtual and in-person people can meet! What are some of the greatest lessons you’ve learned from starting your business, or perhaps something you’d tell your younger self when just starting off? Be patient with yourself… you’re growing. I was in it, hustling so hard, and was really hard on myself but I enjoyed every moment of it. Of course there are moments when you’re exhausted and you’re wondering if you’re good enough, but it’s all part of the process. You have to enjoy the process of being an entrepreneur. If you don’t enjoy the grind of sometimes working seven days of the week or not taking a vacation, then you’ve got to do something else. You have to work hard, hustle and love what you do. There’s no end game here; I’m just doing it because it’s a lot of fun and I’m trying out new projects. For me, it’s about loving the process. If something isn’t serving me, it’s time to let it go. You’ve created such a sense of community among your students in Boston through RunYoga, as well as your private and public yoga classes. What about the Boston community inspires you most, and how has that trickled into your work? The Boston community is so tight-knit and everyone knows each other. There’s such a cross-pollination of people. They love running, activities and events, and people here are so excited to meet and know each other. At RunYoga, I’ll encourage attendees to look at each other and say hi… even with “Namaste,” I have them look their neighbors in the eye. How has being a mom impacted your business, and how do you maintain a healthy balance between the two that works for you? It’s forced me to be really real about what serves me. I love what I do so much, but it’s really looking at my time and my effort, asking how much energy does this give me and being really smart about that. It’s hard when you’re so emotionally attached to your clients and classes, but when I held my baby in my arms, I was forced to ask, “Do I really want to be away on a Sunday?” and the answer was no. I spent time looking at my schedule, fitting in what serves me, my energy and my family. Now my schedule is all weekday mornings I’m either teaching yoga or corporate clients, and then one night class for RunYoga. Wednesdays and Fridays are full days with the baby, so I’m able to be a mom and teach. What advice would you give someone who may be nervous to take that first yoga class or run their first race? How do they get started? You get started by losing that judgment and that attachment to something. It goes back to being involved in practicing. Why not just practice yoga once? Let go of the results and outcomes of what you think it should be, and allow yourself to enjoy the process of trying something new. It’s so exciting, so enjoy that time and don’t get caught up on where you think you should be! Also, know you’re going to learn something. You’re always learning and growing! I’m not just going to stop yoga because I can do a handstand; I do it because it’s teaching me something about myself. It’s called a practice for a reason; practice showing up and take in those lessons. Running too allows me to see things clearly; it’s an incredible self-care tool for me. Interested in other women changing their industries? Meet Robin Berzin, MD, and founder of Parsley Health, where holistic medicine is an achievable goal.